I generally write way more about things that I really, really like, but here are a few golf related items that have grown on me of late. Maybe they are just things I like, maybe you will like them as well. Just throwing them out there. The best ball mark repair tool I’ve ever used: I will admit to being one of those people who are a bit obsessed with fixing ball marks. I’m definitely a fix mine and a few others as well kind of guy. Now I have a new weapon for doing that. What is this? : This is a Pitch Pro Golf tool. I’ve had the one above for quite a while and was thrilled to see that my club got them before this season. I know you might look at this and say, ‘How can a one-prong tool really do the job?’ My answer to that is simple: It does it way better than any of the two-prong tools you might have sitting in your bag. The beauty of it is that it is an idiot-proof. With too many ball mark repair tools, golfers stick it into the ground, push down, forcing the middle of the ball mark up to the surface. That damages the root structure and often leaves a dirt mark on the green that takes weeks to recover. What I like about the tool above is that you push it into the ground and all you can do is push the edges to the center. That’s what you are supposed to do. One caveat: These things work better on greens that are a little firm. They don’t work as well on big muddy, crater ball marks. These aren’t for clubs where the super likes to overwater the golf course. The list of clubs using this thing is pretty interesting. There are certainly some big names. 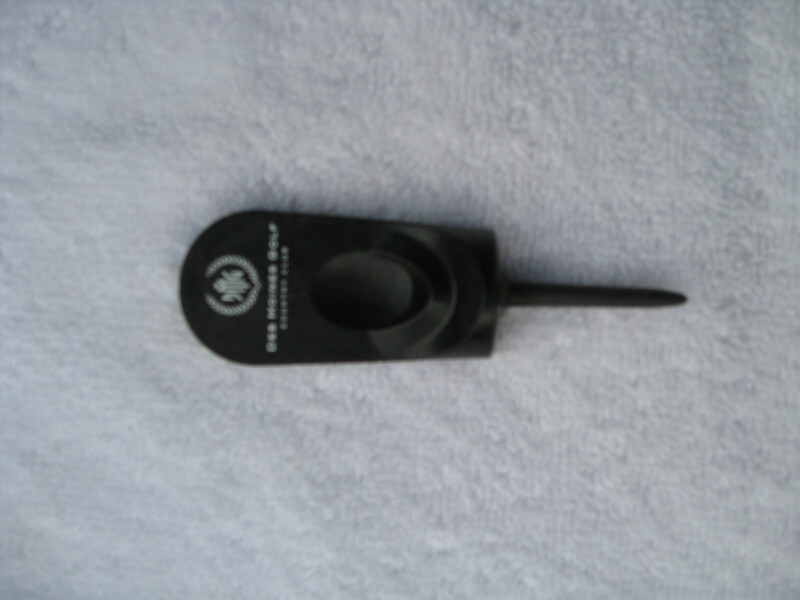 Has this plastic tool helped keep our greens smooth? I don’t know that I can say that, but this is a whole lot better than giving people tools that rip up the greens. A towel I can’t lose: The folks at Club Glove have been crowing about how Rory McIlroy used their microfiber golf towel at the U.S. Open. Well, I’ve been using the towel for more than a year. While I like the microfiber material and that it really absorbs water, the main reason I like it is because of the slit in the middle of the towel. Why is that so great? I put my putter head through the slit and the towel hangs off my bag. It can’t go anywhere. It is less likely to end up being taken off of my bag by the kids in the bag room. I know a towel isn’t that big of a deal, but as someone who likes one wet end of the towel to clean a muddy golf ball or dirty clubs and a dry end to wipe my hands and/or face, this is a winner. A Monday morning read: I subscribe to GolfWorld magazine in addition to Golfweek. For a few months, they’ve been putting out an electronic edition that lands in the email box of subscribers each Monday — and every day during major weeks. It provides a very nice summary of the weekend and way, way, way more than I get from my local newspaper. It’s good stuff. And a fitting blog: I just found a good blog over the weekend. The title? Golf Stuff We Like. Well, lets just say that I like many of the same things that these bloggers like. A daily deal worth buying: Big Fish for $30!!!! From the Super’s perspective the Greensfix GFC1 is the ultimate ballmark repair tool for Joe Golfer – IMHO. Most amateurs and some Pro golfers incorrectly fix ballmarks by lifting the damaged turf as you mentioned. With the GreensFix it is impossible to “lift” the turf. Rather, the correct repair motion pushes the damaged turf back into the depressed area. I am sure that the single-pronged Pitch Pro tool you referenced above in the hands of a knowledgeable golfer is a fantastic repair tool. But…in the hands of the average golfer it will lift turf. Just my 2 cents worth. By the way I really enjoy your blog! Thanks for the comments and the kind words on the blog.